A SMOKING PIPE is a device made to allow the user to inhale or taste smoke or vapor derived from the burning or vaporization of some substance. The most common form of these is the tobacco pipe, which is designed for use with tobacco, although the device itself may be used with many other substances. The pipes are manufactured with a variety of materials, the most common (as the popularity of its use): Heather, corn, meerschaum, clay, cherry, glass, porcelain, ebonite, acrylic and other more unusual materials. Chantix - prescription medication used to treat nicotine addiction. It both reduces cravings for and decreases the pleasurable effects of cigarettes and other tobacco products. Fine PIPEs International - since 1997. "A Venue for Collectors of Fine Smoking Pipes and Accessories." For Pipe Lovers - Cigar Aficionado. Glossary A-Z - "Pipe smoking, like any specialized pursuit, is replete with its own cryptic words. Here is presented a glossary of words particular to pipe smoking, defined so that you may not only smoke like an accomplished pipe smoker, but speak as one also." Guide to Tobacco Pipes & Pipe Smoking - Gentleman's Gazette. Hookah - single or multi-stemmed instrument for vaporizing and smoking flavored tobacco, called shisha, whose vapor or smoke is passed through a water basin—often glass-based—before inhalation. Pipe dream - A plan, desire, or idea that will not likely work; a near impossibility. PIPE MAKERS - Scandinavian Pipes. Pipedia - "A wiki for pipes." PIPES AND TOBACCOS MAGAZINE - "A magazine for tobacco and pipe enthusiasts." Quarterly magazine with articles about pipes, pipe manufacturing, custom pipes, and tobaccos. PIPES MAGAZINE - "The #1 Source for Pipes and Pipe Tobacco Information." The PIPE Tart - "To bring to the pipe world wonderful smoking and beautifully crafted handmade pipes." When London was the smoking capital of the world - The Telegraph. Alfred Dunhill's The White Spot - since 1912. "100 years of craftsmanship behind every pipe." ARMANI / CASA - Casanova pipe set. Armellini Pipe - since 1960. Ashton Pipes - since 1983. BBB Pipes - since 1876. "BBB stands for classic affordable quality pipes. The annual Christmas pipe is the pipe worlds answer to the noveau beaujoulais wine with a strong demand every year and an even stronger demand on old editions." Bentley - "Bentley pipes are designed for excellent smoking quality. They are stately interpretations of classic designs. The pipes themselves are naturally of best-quality briar wood." briarworks - since 2012. Produces high quality, elegant products in a wide range of prices. Chacom fine Pipes - since 1825. "The biggest French brand to date knowing how to ally Tradition, Creation & Innovation." Charatan - pipe makers to royalty since 1863. "One of the oldest London pipe makers, Charatan was for years Dunhill's chief rival." CUPOJOES.COM - since 1995. Online pipe store. Large selection of pipe makes. "We are the LARGEST Dunhill pipe retailer in the USA!" DANISH PIPE SHOP - since 1969. "One of the finest pipe shops in the world specialized in primary Danish handmade tobacco pipes." Davidoff of Geneva - since 1911. "The ultimate destination for tobacco pipes. Our Davidoff Italian-made pipes are crafted from the finest briar and shaped into beautiful designs with elegant finishes. Davidoff Italian pipes feature a hand-finished bowl and fitted acrylic stem. Now available in sandblasted black, red brilliant and natural light brown." DON CARLOS Pipes - since 1992. DUNHILL PIPES - since 1912. "Alfred Dunhill Pipes are the definitive source of pleasure and status for men of the world, offering high grade luxury pipes." Falcon Pipes - since 1936. "The #1 Falcon Website Anywhere. Over 2,000 Pipe Combinations." Ferndown Pipes - since 1978. "Purveyors of hand made smoking instruments." Production is now limited to around 1500 - 2000 pipes a year. GOUDA Clay Pipes - "The original Dutch Gouda Clay Pipes." Gubbels - since 1870. "The Pipe Manufacturer." The house of E. Gubbels B.V. in the Netherlands is a leading manufacturer of fully handmade briar-root tobacco pipes with brands likes BigBen & Hilson. J. Alan Pipes - since 2004. "Each J. Alan Pipe is handmade in USA using the finest materials." James J. Fox - since 1787. London. "Buy Wooden Smoing Pipes." James Upshall - since 1978. "Makers of The Finest Briar Pipes." LEMAIRE - since 1896. 59, avenue Victor Hugo, 75116 Paris, France. Luigi Radice - since 1960. Produce between 1,200 & 1,500 pipes annually. Luigi Viprati - since 1972. "Italian Handmade Smoking Pipes." NORDING Pipes - "Danish exclusive pipes. For more than 50 years Erik Nørding has produced handmade pipes for pipe smokers all over the world. His passion is his work and still today he finds nothing more thrilling than to sit down and carve a beautiful pipe from A to Z. We grade our handmade pipes from group 11 to group 30." Parks PIPEs - "My desire is to design pieces that elegantly juxtapose a post-modern aesthetic with classic english shapes. A fine pipe is an object of art, utility, and collectibility." Paronelli PIPE - "Since 1945 excellence in briar." PETERSON PIPES OF DUBLIN - established 1865. "The Thinking Man Smokes A Petersons Pipe." pipes and cigars - "More Brands and Types of Pipes." PORSCHE DESIGN Pipes - since 2003. "Porsche offers a variety of uniquely designed tobacco pipes to fulfill your smoking needs. All of the pipes are made with the finest quality briar and supplied with an acrylic mouthpiece and 9mm absorbent filter. Experience Dutch craftsmanship and unique designers' art combine in a classic standing shape with a modern style with one of these pipes." Purisme Carbon Fiber Pipe - Limited Edition: US$2,950. Rad Davis Pipe Cherrywood - "Hand Made Pipe." Radice Pipes - since 1980. Produce between 1,200 & 1,500 pipes annually. Sasieni Pipes - "Collector's favorite since 1919." Sautter of Mount Street - since 1961. 106 Mount Street, Mayfair, London W1K 2TW, U.K.
SAVINELLI - since 1876. "Welcome in our world! A world made of feelings, a world where, through the pipe, you can use all your five senses." S. E. Thile - "Handmade Pipes." Made by hand to exacting standards from Italian, Algerian, or Grecian briar. Stems are hand cut from the finest German Ebonite or Cumberland rod, and designed for maximum comfort. Smokingpipes.com - since 2000. "Fresh Pipes Served Daily." This is the place to be for an almost continuous parade of pipes new to the website, both new and estate. It is updated twice a week, on Mondays and Thursdays, with hundreds of fresh pipes, and additional special updates occur throughout the week. STANWELL - since 1942. "When pipe smokers talk about pipes that are consistently great smokers, exhibit the creative and beautiful designs that exemplify Danish pipemaking and offer the best value in factory produced pipes, they are talking about Stanwell." The White Spot - "A definite source of pleasure since 1912." Alfred Dunhill Pipes Website. Thomas James Smoking Pipes - "Fine Handmade Briar Tobacco Pipes." Vauen - "Pipe artisanship since 1848." 160 years of tradition and modernity. Repeatedly changing models throughout the year constantly offer something new. Vauen produces over 50,000 pipes a year. 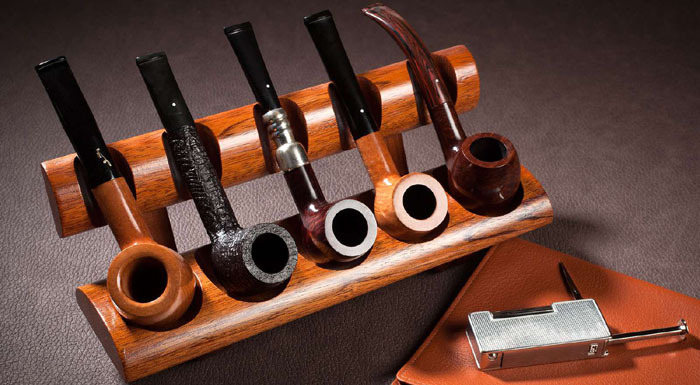 Each pipe connoisseur can choose his personal masterpiece from over 250 different models. WINSLOW HANDMADE - since 1968. "Danish handmade pipes."